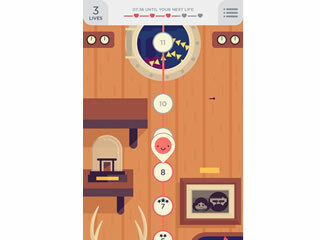 TwoDots is one of those super simple games with very simple but cute graphics and addictive game play. 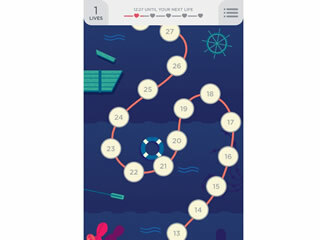 In this fun connect-the-dots game, you have an objective to connect a certain amount of dots of different colors in a certain amount of moves. After you connect them, they disappear and the dots about them fall down to fill in the gaps and new dots come down from above (see screenshot). Sometimes a level will have some blank spots to add an extra little challenge. You get five lives, which you lose if you fail a level. There are 85 levels which spread out on a cool map over a few different worlds. 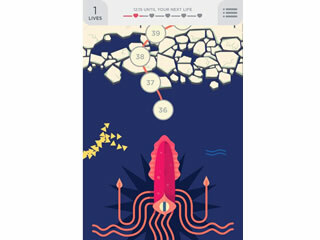 This is an addicting little game that will make you think. You can buy new lives, but if you’re cheap like I am, don’t worry, because you get a free life every 20 minutes. There’s a maximum of 5 lives, though, so if you wait 100 minutes, you’ll get a full refill, but if you wait for an entire day, then you don’t get any more. On one hand, that’s a good thing, because it prevents players from waiting for days to get a huge amount of lives. But, on the other, if you have a difficult level that takes you dozens of tries, then you’ll be stuck waiting for hours just to get the lives necessary, or having to pay for life refills. The game is a real brain-teaser, but there’s still an element of luck that goes into it as well. The dots are replaced at random, so there’s no way to memorize the way to beat a level. You still have to be able to anticipate where the old dots will drop to, so you can still do some planning even if you don’t know exactly what is going to happen next. Great combination of luck and skill! It's good to have the game on your device to play it when you have a minute to kill.